Ragi recipe collection. Indian Nachni Recipes. Ragi, also known as Nachni or Finger Millet, is a super millet that should be a must in everyone's diet. A great source of protein and amino acids, it is especially important for vegetarians to consume to get proper nutrition. They look really small, like mustard seeds, and are reddish brown in color. The outside hull of ragi is not edible, hence it is removed and then used. It can even be ground into a powder and be used a flour, which is the most common way of using it. Ragi is used predominantly in the southern states of India. Ragi Puttu, a very famous breakfast of Kerala, is a preparation of ragi flour and coconut which is cooked in coconut shells and pressure cooked and gives a homely taste. You can even make no fuss, Ragi and Coriander Uttapa, that are instant to make and absolutely delicious. Porridge is a sweet, breakfast cereal dish all around the world and it has many variations. One very healthy variation is Jowar, Ragi and Date Porridge that is sweetened with dates and is so easy and delicious to eat that even toddlers can start eating it. Another easy to make breakfast recipe is Multiflour Idli. Even though it requires overnight soaking, it is relatively super simple as it is only supposed to be blended, combined, fermented and steamed. Many people do not know how to use whole ragi in their food! It is, infact, quite easy to do so. You can use them to make mouth-watering snacks which have the added advantage of being healthy. By simply soaking ragi overnight, you can soften it and then use it to make Ragi and Broccoli Cutlets. And the best part? we are coating them in oats instead of breadcrumbs to make them extra nutritious. Soaked ragi can also be used to make Stuffed Ragi Pancakes, where the stuffing is made up of different veggies and spiced with chilli flakes. Bhakris made with ragi are very popular in Maharashtra, but it is really hard to make kids have it. For that, you can jazz it up a bit and make Ragi Bhakri Chivda with spinach, onions and spice powders to make it taste delicious. Mini Nachni and Coriander Khakhras require no hassle as you use ready flour and they are the best way to satisfy your hunger pangs in under 100 calories! As we all know, Ragi is very healthy and hence it is really easy to convince everyone around to eat them. 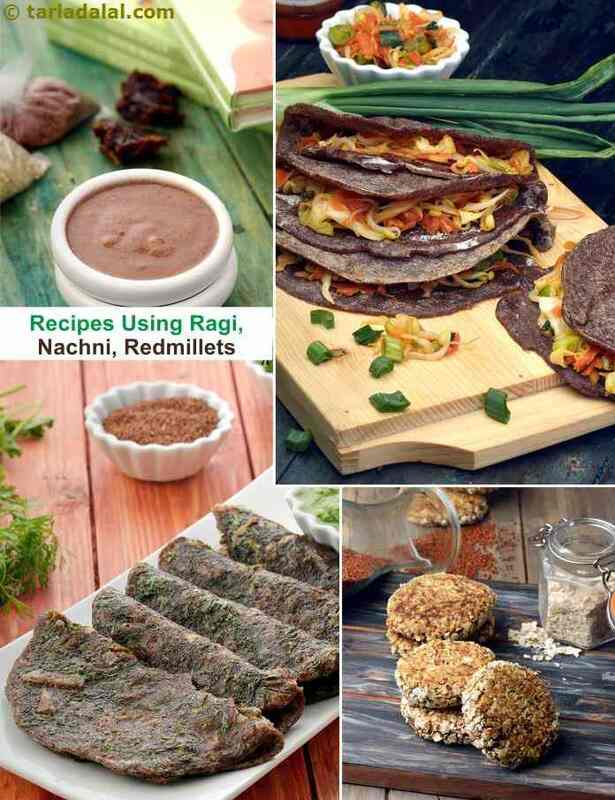 There are so many recipes you can make with ragi and in so many ways. You can make a basic Ragi Roti to go with subzis instead of phulka roti. Instead of having the fried chips and snacks, it is better to make and eat Ragi and Oats Crackers. These crackers are baked and hence you can store them for a long time! The beloved gujarati muthia gets a healthy twist with ragi, especially when teamed up with methi to make Nachni Methi Muthias. Apart from these, you can make dosas, crispies, upma and a lot of other things. Pregnant women are supposed to include ragi in their diet for their overall health and benefit. For this, as it has been happening for generations in India, Nachni Ladoos are given to pregnant women as they are nutrient dense. Ragi flour can even be converted into delicious Ragi Sheeras, halwas and Ragi Barfis. Ragi and Ragi flour is high in protein and great source for vegetarians. In addition its gluten free, high in fiber which in turn is good for diabetics and a healthy heart. Ragi flour creates a much lower surge in sugar levels compared to wheat. Ragi is rich in Magnesium which improves insulin response by lowering insulin resistance. A must read for the benefits of ragi to include in your daily diet. Enjoy our Ragi recipe collection, Indian Nachni Recipes below.